Battle Bunnies: Adeptus Titanicus - what we know so far! Adeptus Titanicus - what we know so far! - It's basically the new EPIC. - It will be set during the Horus Heresy (for now). It's just easier to start with Titans vs Titans, and expand later on. - It will be in 8mm scale. You will be able to make out power armour marks. - Since all is done in CAD, they can release all titans done for AT also in 28mm scale if they prove to be liked. 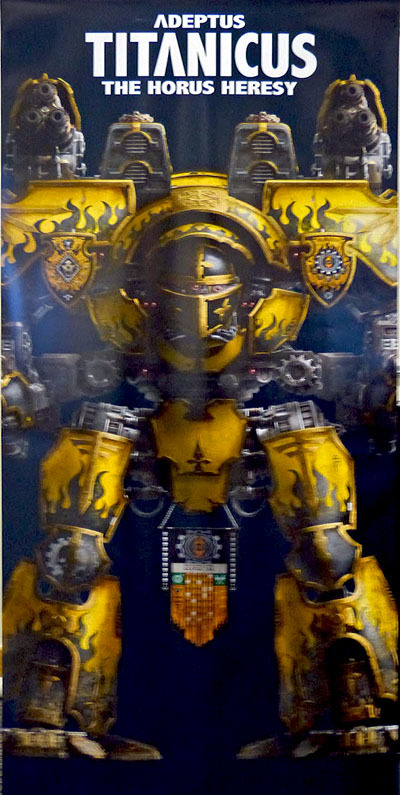 - The reason the new Knight got upscaled was because of AT - they wanted to make him look distinguishable from the Questoris and Cerastus chassis. Oh, and he was originally meant to be the 'Warden'. - They will start with titans, and will expand to tanks/flyers and infantry aswell as other races later. But that's still a while out. - The first models will be Warhound/Reaver/Warlord aswell as Knights, done in resin. - The starter box will be just a game set-up starter, without models (atleast that's what's planned for now). It will be done in plastic and be all about scenery and rules. - They may do a nice Black Book version of the rules too, including propper background and lots of colour schemes! 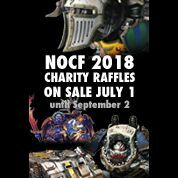 - The planned release is the next Horus Heresy Weekender. - They're digging into all previous Epic games for inspiration, but it will be a new rule set. - Expect Titans to have a plasma reactor power tracker to keep track of how much power they have. - Harpoons will be back but nowhere near as ridiculous as they used to be! - Engine war will be a bit of a slugfest, with Titans slowly blasting each other to Atoms, staggering about, weapons missing, systems burnt out, but still able to fight until you smash the legs, pulverise the MIU's or cause the reactor to go nuclear. - Campaign games are the default mode of play, similar to Necromunda as he described it. With options for competitive and open play. Sounds like I need to save up a bunch of money. good thing I own all the knights I need. Also I'm quite interested in using the rules system for 28mm models (aswell as what table size you would need to make it work!) for really big battles. It's mostly to have the sa,e scale between all models. Old EPIC had a different scale for their titans, flyers, tanks and marines. Col. H, it's more like 2cm. You can tell just by looking at the scales; 8mm model is 25% larger than a 6mm model then for a difference of 5cm to be correct the original plastic Warlord models must be 15cm in height, which they are nowhere near. I can check 100% when I'm at my parents' next but the original Warlord models were roughly 3" tall, which is roughly 8cm so if FW are scaling up by 25% and the original height of the old and new designs are the same then a new scaled-down to 8mm Warlord should be about 10cm tall or a bit higher. So when is the next HH Weekender? Yes yes yes yes please. Ptsd titans? Overloading reactors? New patterns in 8mm scale that can be brought to 28mm with enough interest? Harpoons! Yessss pleaseeeee. Awesome. Thanks for he coverage. Keep it coming! Thanks for this, really interesting. Did they say whether there would be any plastic models (as opposed to starter set scenery etc.) at some point? The information we got - only resin models. FYI old Epic infantry was already 8mm, not 6mm. Its bloody hard to get the scale right. A lot of companies don't do nearly as well as GW has over the years. The plasma tracker was very interesting. Each Titan will have a certain amount of power they generate per turn. They then use the power to move, fire weapons, do damage control and repair voids. There's currently an overload mechanic whereby you can increase the power they generate to do additional actions. However, overtaxing the reactor carries risks, though he didn't expand on the risks. He described each Titan as having its own unit card with stats (move, turns etc. ), plasma power tracker, damage track and weapon hard points. He seemed to be describing a hybrid of 1st Edition (weapon hard points, stats and refits) and 2nd Edition Titan datasheets (hit location and critical damage tables). He described a typical Warlord as having 4 inch movement and a single 90 degree turn. Warhounds having an 8 inch movement and could make two 90 degree turns. In his playtest, he described the final turn with only 1 Warlord facing off against 2 Warhounds, with everything else disabled or destroyed. One Warhound distracted him to the front, and took down the Warlords last remaining Voids. The Warlord then returned fire and blew it away. But, crucially, failed his reactor overload and was not able to take an additional turn to face the other, hidden, Warhound with his thicker frontal armour. This left his rear, and the vulnerable reactor housing, exposed and unshielded. On the Warhound’s turn, it moved out and fired on the rear of an unshielded Warlord and breached its reactor! This is something that, as he described, was hinted at in the background but something that he'd like to explore within the game. I think ideas are still being developed, but he wanted to give Titan's their own personalities, for example the close-combat equipped Titan turning into a berserker. The idea being that you try to issue the Titan an order but the Machine Spirit, feeling more than a little rage as a result of doing far too much close combat and not having any rest, starts exerting its influencing on the Princeps! He mentioned that during campaigns, you'll want to rest Titans as they become mentally burnt out and start developing undesirable personalities. He described the default game as Campaign games and used Necromunda as an example - you have a roster and for a game, you choose entries from your roster. Between games, you can apply for refits and your crews gain experience. Ejecting heads were mooted as an example of the Princeps and Moderatii being able to survive the destruction of their Titan. He described that, similar to Age of Sigmar, they're also planning to have an open play and competitive play option as well for those who just want to plop down some Titans and just have at it. He really wants to codify Titans. He's currently been scouring archives and has got a lot of material including Jes Goodwin’s ancient sketches. He got very excited when I mentioned Psi-Titans! Imperator Titans would only appear if the game proves to be popular. I asked about Banelord Titans and vehicles. Again, it's all about popularity. However, he is writing the rules engine so that they are able to add in vehicles or infantry without requiring a whole new set of rules to be written. He described the jarring effect of Titans and Infantry needing two sets of rules in previous games and it's something that he definitely wants to avoid. Great to hear campaigns are coming back. This was really cool in codex titanicus. The number of turns is cool too, and very old school. Was great way of showing how agile Titans are. Great stuff. well, i´m starting with that game when i finish collecting Tau GC and Imperial Knights no sooner. I'll never be able to own enough 30k/40k size titans to play this, so I'm very excited indeed to be able to get then at a smaller scale. Really can't wait for this to come out! I am a 100% sure that you have misunderstood the contents of the starter box. Otherwise it makes no sense at all.